What do you picture when you think of the best Halloween costume? Do you picture “a princess” or a “basketball player?” Perhaps it’s something more original, like a DIY costume or a character from a movie. On Halloween, many teenagers took their costume to social media. Pictures of angels, devils, and characters from the “Purge” were the most popular costumes seen this year. However, were these the costumes that stood out on Wednesday? Many different costumes were seen on the North Campus, ranging from Snapchat filters to a very creative pencil. Sophomore Byron Bishop grabbed many student’s attention by coming as his famous pencil. Multiple sophomores agreed that Bishop had one of the best costumes due to its creativity and effort. “It was very creative, and it was something I’ve never seen before,” Sophomore Reed Hooks said. 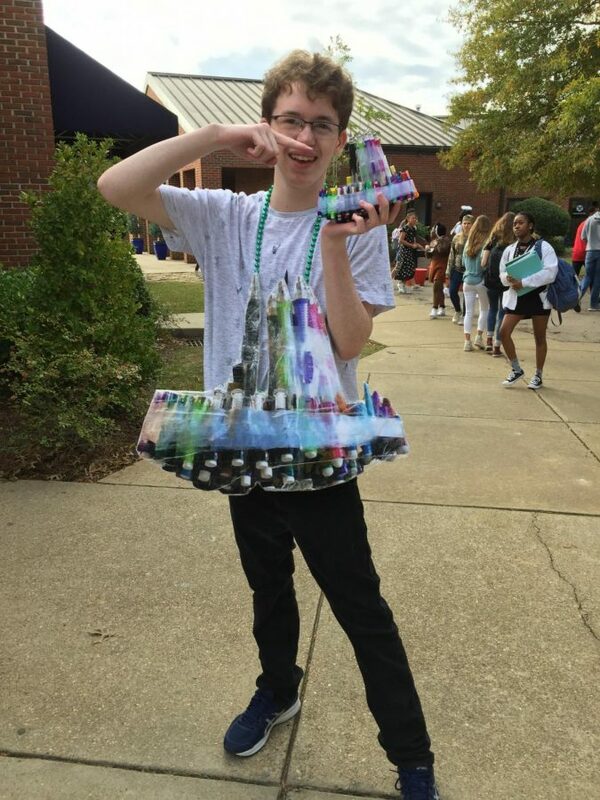 The class of 2021 wasn’t the only class to impress students with their creative costumes. Junior Mirren Viola dressed as Kim Kardashian, only using materials from her house. Viola thought outside the box as she stuffed pillows in her sweatpants and shirt, making her costume comedic. “I had the best costume out of the grade, I was Kim Kardashian, duhhh,” Mirren Viola said. “I thought it was very funny and really original,” William Langford said. “I loved Ms. Kelly’s costume the most out of the teachers because it was really funny. It related to us since we all use Snapchat and the filters; I could also tell she put a lot of time and thought into it,” Sophomore Maya Leflore. After asking students around campus who they thought dressed the best, all the costumes turned out to be DIY projects; some taking as long as five hours to make. Thinking out of the box and not following the crowd is the way to go when wanting to grab your classmate’s attention. When planning your next Halloween costume, consider making your costume, and let creativity be your driving force.